Truly stopping to think about homeless children is a difficult and sobering task. We are all faced with the reality of homelessness at times, especially those of us who live in larger cities. But one young boy went beyond sympathy and decided to do something about homeless children. That young boy is Zach Bonner, and Little Red Wagon (Philanthropy Project) is based on his story. The film begins with actual news footage taken during and after Hurricane Charley, a storm which devastated a large region of gulf coast Florida in 2004. Young, red-headed Zach Bonner (Chandler Canterbury, The Curious Case of Benjamin Button) and his family are bunked down in Tampa to wait out the storm. After learning that the hurricane has veered into the gulf, Zach sees news footage of the intense damage and gets an idea to send food and water to those who’ve lost their homes. 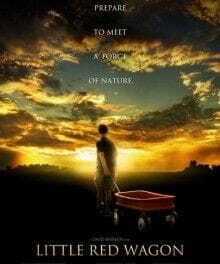 Along with his older sister Kelley, played by Daveigh Chase (Lilo & Stitch), Zach pulls out his titular red wagon and collects donations from the neighbors. But that’s only the beginning. The movie progresses steadily upwards for Zach and his cause, which eventually turns from hurricane relief to a passion for helping homeless children. However, though Zach’s journey is motivating, the emotional weight of the film is pulled by his mother Laurie, played by Anna Gunn (of TV’s Breaking Bad). Laurie, a single mom who’s been widowed since her son was just a baby, pours her heart and soul into her family. However, she has a tumultuous relationship with her 16-year old daughter Kelley, and struggles to find the balance between supporting Zach’s dream of raising money for the homeless and supporting the less motivated (and therefore more overlooked) Kelley. Gunn gives a soulful portrayal of a strong mother desperately trying to stand behind the noble passions of her son, which often conflicts with Kelley’s need for independence and individual attention. While the plot follows Zach’s efforts to fundraise and eventually walk from Tampa to Tallahassee to raise awareness, the core of the film follows the familial tension as it flip-flops from heart-warming moments of teamwork to screaming matches between mother and daughter. To make Zach’s cause of homelessness-awareness more tangible for audiences, a second storyline is developed which shows the worsening financial plight of Margaret Craig (Frances O'Connor, A.I. ), a young, recent widow struggling to provide for her young son Jim (Dylan Matzke). Laurie and Margaret interact briefly near the beginning of the film, when Laurie is collecting donations for hurricane relief, but from there their stories change drastically. Margaret and Jim plummet into poverty when she loses her job, and eventually become the very people their former neighbors have started to help: homeless, with nothing but the clothes on their backs. This side-plot does often feel detached from the main thread of the story, but serves as a constant reminder of the reality of poverty and homelessness. The two storylines do cross over at one final point, however, in a heartwarming scene showing the tangible results of selflessness and living to the poor. Donations to a homeless shelter may feel anonymous to the giver, but real people receive them and benefit from them. The film’s characters are interesting enough and the plot (based heavily on Zach’s true story) is inspiring, with few noteworthy flaws. The dialogue at times is simplistic, and the transitions between major hurdles (such as starting a 501©(3) organization or finding a job) are sometimes glossed over with very little of the real-life mess and pain. The little boys are a little too perfect and well-behaved, and Kelley is a little too typical of the standard movie rebellious teen. But overall, nothing distracts too noticeably from the encouraging story and the compelling relationships. What is good and beautiful about this film? It points to several important truths. If you’re reading this on a computer right now, you are blessed and richer than you know. Material wealth and even the humblest of possessions can be lost, destroyed, or stolen in a moment. Growing up without a father is a big deal, and hurts. Mothering children without a husband is a big deal, and hurts. Relationships are more important, and harder to maintain, than big, noble causes. The poor live among us. The poor will always live among us. We can do more to help them than we often do. You’re never too small, or too young, to pull your weight and make a difference. Sometimes it’s only as heavy as pulling a little red wagon. To find out more about Zach Bonner and his mission, visit The Little Red Wagon Foundation. Mature Themes: Homelessness, death, natural disasters, poverty, stealing and cancer are all dealt with. The relationship between a daughter and mother also deals with heavy-natured topics such as growing up in a single-parent home and troubling family dynamics. Violence: A girl throws a bag across the room after a fight, breaking a few household objects. A woman yells at her daughter through a door and slams the door with her hand. A young boy falls down onto pavement and scrapes his arm very badly (blood is shown). Religion/Morals: Family love and true charity is upheld, stealing, violence, and selfishness cast in a negative light, and the belief in something bigger than yourself is the main theme espoused throughout the film. Debbie Wright is Assistant Editor for Family Content at Crosswalk. She lives in Glen Allen, Virginia and is an avid writer, reader, and participant in local community theatre.